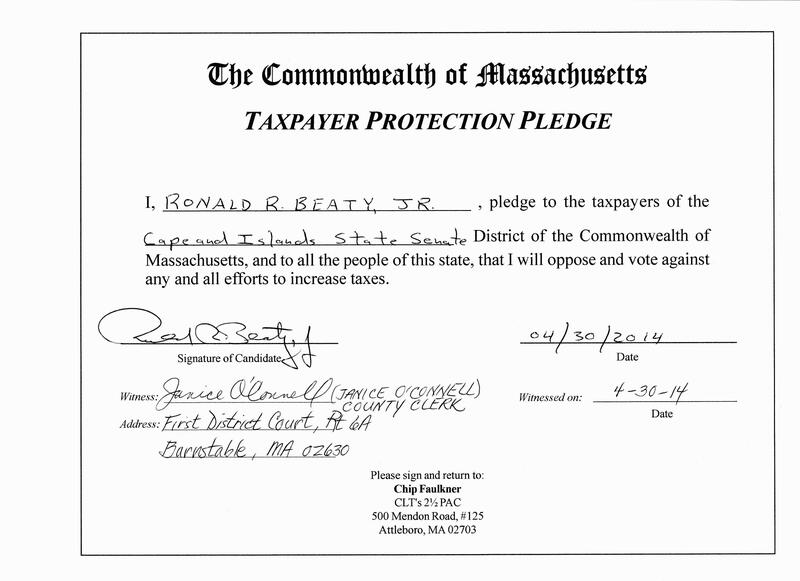 The pledge, which was witnessed by Barnstable County Clerk Janice O’Connell, states that Beaty will oppose and vote against any and all efforts to increase taxes. The “Taxpayer Protection Pledge” has been forwarded to the organization, Citizens for Limited Taxation. This entry was posted in Barnstable County, Cape Cod Regional Government and tagged allan waters, allen waters, barnstable county, cape and islands, cape and islands district, cape cod, cape cod commission, citizens for limited taxation, dan wolf, daniel wolf, massachusetts, massachusetts state senate, political candidate, republican, ron beaty, senator wolf, state senate, state senate district, state senator daniel wolf, state senator wolf, taxpayer protection pledge, taxpayers, tea party, tea party platform. Bookmark the permalink.